THE internet's premier website for heavy metal! -7/11/08: It's been over a year since Only-Rock was last updated, and its about time I sort through the files, make corrections, and update information. Be prepared for lots of new pages/lots of deleted pages with old information. Let's plan on a grand reopening on September 1, 2008. More info on the way. *Please send your comments, requests, and questions through our 'Comments' page. No solicitors! I have a no-tolerance policy for spammers and solictors and I will turn them in. *Please sign our guestbook (on the left panel). Also, please tell your friends about Only-Rock by clicking on the Recommend This Site envelope (on the left panel). New to Only-Rock? Take a second to see what's on the premier site for 80's metal. -The Rock News Blog: The name tells all. The Rock News Blog has articles and info about your favorite bands, along with info about the state of Only-Rock and misc. Editorials. -Weekly Look: Basically the O-R tabloid. We go over everything that has happened over tha past week in Rock. -Band Bios (known as the Band Pages): A biography for all of the bands we cover, along with pictures, music videos, discographies, and album reviews. You can find the Band Pages directory at the bottom of every Only-Rock page. -Music Videos: The all redone music video page is under construction. -Monthly Special: This is an Only-Rock exclusive 'behind the scenes' monthly article. -Rock On T.V. : This is the place to hear about all of the upcoming rock t.v. shows and movies. For US only. -Rock Trivia: You think you know your rock? Play Rock Trivia 1 or 2 to see! Also: How To Be An Ultimate Hair Metal Star! can be found here. -Links: Links to official band sites and fans sites approved by Only-Rock can be found here. -Comments/Requests: Have a comment, question, or request for Only-Rock? Send it in here! Reconstructed for easier use! -Amber Alert & One.Org links: These banners are located towards the bottom of the page and are organizations that O-R supports. The first is the US Amber Alert ticker, the second is for the Canada Amber alert, and the third is a banner to One.org. Click on any to see more information. -Note: Only-Rock is always twisting, deforming, adding, deleting, or otherwise changing its pages. Changes may occur that may not be noted here. 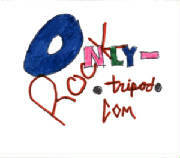 Copyright © 2004-2008, Only-Rock. All Rights Reserved. Do not use any materials without permission from Only-rock through the Comment Form. All Logos and or likenesses thereof are Copyright protected, and are property of each respective band listed. Visitors since reopening on Dec 1, 2005.